Canadian Bianca Andreescu has her first WTA title. 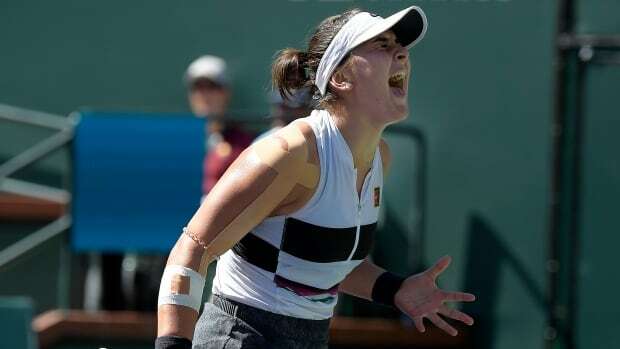 The unseeded 18-year-old from Mississauga, Ont., upset eighth-seeded German Angelique Kerber 6-4, 3-6, 6-4 in the women’s final at the BNP Paribas Open on Sunday. Andreescu has become a major story on the women’s circuit this year. With the victory Sunday, Andreescu has won 28-of-31 matches this season and becomes the first wild-card entry to capture this event. Andreescu needed roughly 40 minutes to take the opening set. Neither player served well — Andreescu was 60 per cent on first serve while Kerber was at 67 per cent — but the Canadian held serve throughout and won all of the points on her second serve, compared to just 55 per cent for Kerber. At the break, Andreescu told her coach, Sylvain Bruneau, “My feet were burning” and that she was having trouble moving. Bruneau calmly encouraged his pupil to continue battling and competing. Andreescu had three championship points but couldn’t pull the trigger. Kerber secured the break when Andreescu’s attempted drop shot went into the net to pull to within 5-4 as the Canadian received some treatment on her right leg at the break. Again, Andreescu looked fine once play resumed, capping her impressive tournament run by converting the fourth championship point for the break and career first. And upon capturing the victory, she kissed the playing surface then acknowledged the crowd.